HÀ NỘI — Việt Nam needs to improve the quality of weather forecasting and enhance international co-operation to prepare for natural disasters, Prime Minister Nguyễn Xuân Phúc has said. The PM made the statement at a meeting to review disaster prevention and control in 2016 and layout tasks for 2017. Nguyễn Xuân Cường, head of the Central Steering Commitee on Natural Disaster Prevention and Control, said, 2016 saw multiple extreme weather phenomena such as droughts, extreme cold weather, floods and storms, causing losses of VNĐ39.7 trillion (US$1.75 billion). "Natural disasters struck from the beginning of the year to the end of the year, occurring in all regions with many types of natural disasters," Cường said. 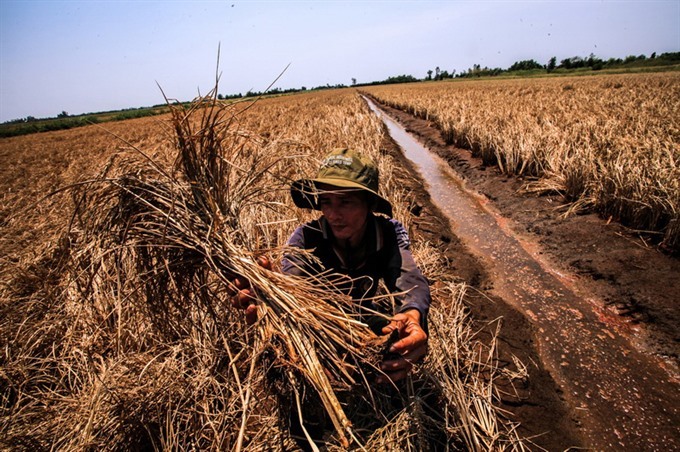 Drought and saline intrusion occurred in the Mekong River Delta, south central region and Central Highlands, he said. Four in 10 storms in the East Sea hit Việt Nam, while tropical depressions led to abnormal floods which caused landslides on the banks of rivers and coastal areas. Natural disasters in 2016 left 264 people dead or missing, while more than 370,000 houses were damaged. Agriculture, aquaculture, road and irrigation system were also affected. Natural disasters have led to stagnant production and harmed the health of people in disaster-prone areas. It was the main reason for the poor performance of the agricultural sector in the first half of last year, resulting in a decrease in the country’s economic growth, Cường said. Despite efforts in flood prevention and minimising damage to humans and property, he said, there were still shortcomings in the work. Facilities and equipment to support disaster prevention work were still limited while staff in agencies often didn’t respond to disasters in a timely fashion, Cường said. Besides natural disasters due to extreme weather, he said, there were some problems relating to reservoirs’ regulations. "Some reservoirs, when regulating flood discharges are not operating properly and are increasing risks for the project and downstream areas," Cường said. He asked local authorities to co-ordinate with ministries and agencies to review the operation of reservoirs. Cường also requested that inspections be conducted on dyke and irrigation works to ensure the projects safety before this year’s rainy season. He suggested that the Government assign the Ministry of Natural Resources and Environment to co-ordinate ministries, sectors and localities to review and adjust the inter-reservoir operations. According to the forecast of the Natural Central for Hydro-Meterology Forecasting, the weather in 2017 will be complicated with temperatures likely to be higher than the average of previous years, especially in the north. Some 13-15 storms and tropical depressions are predicted to occur during the rainy season. Given the difficulty in predicting natural disasters, Phúc asked agencies and localities to re-examine disaster patterns to devise prevention solutions while strengthening disaster control projects. He called for more campaigns to raise public awareness of disaster mitigation.